Bellway gives Fife homebuyers a £5000 boost! Bellway Homes has launched its third development in the Kingdom of Fife, Canmore Heights, offering an impressive collection of three and four-bedroom detached homes in the sought-after suburb of Duloch, Dunfermline. Since opening at the beginning of May, this select development has quickly caught the attention of family buyers in the area. The Edinburgh market has also shown interest, given the ease of access via good road and transport links from Duloch to the heart of the Capital. Fraser Conn, Sales and Marketing Director at Bellway Homes, says: “Bellway Homes has a healthy portfolio in Fife. There remains a strong demand for quality, new homes given the great choice of towns and villages throughout the region and also its proximity to Edinburgh. Bellway Homes has several options available to support buyers, including 5% Deposit Paid, Express Mover and the most recent, MI New Home. MI New Home is a 95% mortgage scheme implemented by the house building industry and supported by the Scottish Government. This incentive aims to help both first time buyers and homeowners with a deposit of between 5-10% secure a new home on properties up to the value of £250,000. Only a short Walk from Canmore Heights is Fife Leisure Park, offering a multiplex cinema, bowling alley, family golf range and host of eateries. The town also has three highly regarded primary schools. Only a short drive away is Dunfermline – a thriving, historic town with all the requisites of modern living available, from excellent shopping and leisure facilities, to lovely public parks and its striking Abbey. Queen Margaret Station is less than two miles from Duloch, offering a regular service to Edinburgh in less than40 minutes. By road, the M90 is minutes from Canmore Heights, providing access to Perth in under 30 minutes and the Capital in even less time, including Edinburgh Airport, which is 20 minutes away via the Forth Road Bridge. 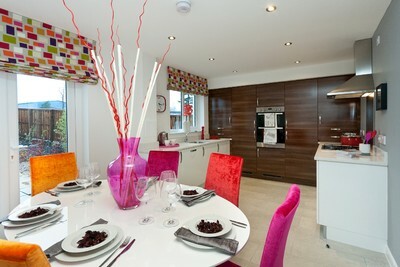 Prices at Canmore Heights range from £169,995 to £234,995. For further information on the development, visit bellway.co.uk.